Momma Told Me: Tasty Tuesday: Candy Corn Oreos- Weigh In! As I promised, here is yet another seasonal specialty treat; this one just as recognizable as the first (White Chocolate Candy Corn M&M's); Nabisco's Candy Corn Oreos! There was so much feedback from the first post; many of you were torn by a love or intense dislike of Candy Corn. Some were also concerned about the intensity of the flavor, versus my perceived underwhelming presence of it. I still stand by my belief that the Candy Corn M&M's rely mainly on the White Chocolate flavoring, and are a more subtle specialty variety. If you haven't tried them yet, for yourself, be sure to keep your eyes peeled at local Target and National 99 Cents Only Stores! I found this weeks featured seasonal foodie delight first online; where one blogger was bragging of Facebooking her find before her friends. In truth, these Oreos did require a bit of hunting. Also stocked at Target, 3/4 of the local branches don't seem to have them in stock. Oddly enough, they weren't found with the seasonal Halloween merchandise either- but stuffed on a shelf behind a column! The packaging resembles classic Golden Oreos, in a yellow peel back sleeve, but clearly displays vivid Candy Corn artwork on it's front. Joining the ranks of Berry Burst, Green Tea, Lemon Ice, Birthday Cake, and Peanut Butter, these Limited Edition Oreos are new for 2012. 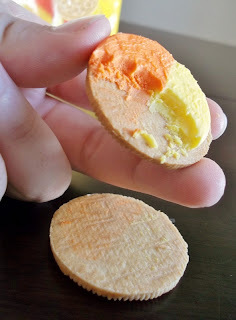 Replacing the traditional Yellow and Orange seasonal cream filled sandwich cookies, with one that is heavily flavored to solicit a candy corn essence, these just might be my new favorite! Again, I am not a big Candy Corn fan- mainly because the candy itself can often crumble or be tough to chew when old/stale, but I've thoroughly enjoyed the accuracy of the flavoring here. These Golden Oreo specialty cookies consist of two extra-sweet halves of orange and yellow cream wedged between soft Golden Oreo discs. The filling seems somewhere between double stuffed and classic, not too thin nor thick, and these certainly fall on the more pungent and sweeter scale of seasonal treats. 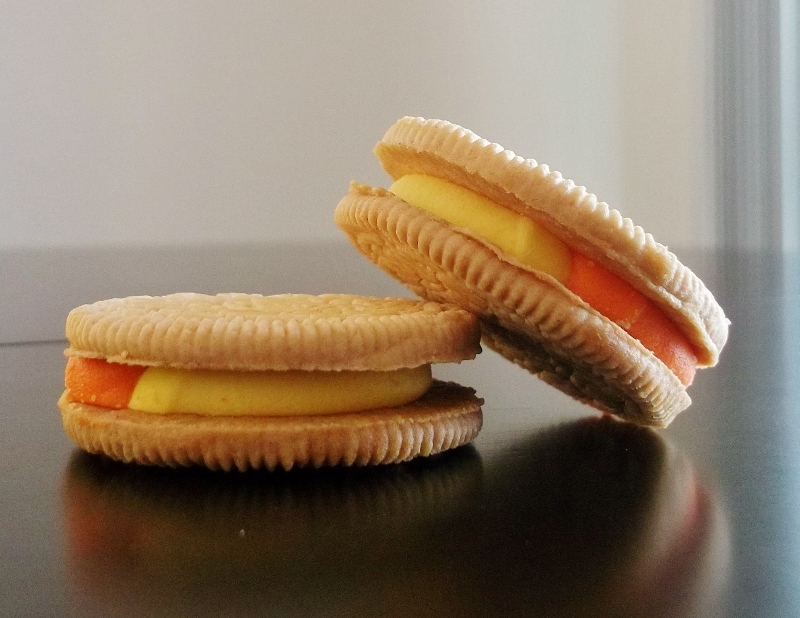 Not only are Candy Corn Oreos tasty, but they're just plain fun to look at. Try scraping the Yellow Cream off first, then tasting the Orange and weigh in on the debate- Are they two flavors, or one? Either way, one thing's for certain, these seasonal beauties go great with an ice cold glass of Milk (Silk for the dairy free, of course)! My sister brought some oreos over and I thought they were these seasonal candy corn type, unfortunately they weren't lol, so now I'm going to have to go to Target to try them out, they look tasty and different. I hate Candy Corn so much i would never buy these!! they are sooooooooooo good.....also another candy corn product that is very good is the m&m's candy corn! and i never liked candy corn because it was too sweet...the cookies are awesome! Hmmmm, not do sure I would like these. They look cool, but I am a standard Oreo guy! I have been looking all over for these. Target says they aren't getting more. I absolutely love candy corn (thank goodness it's only available at Halloween!). These sound fab! These look great! I like candy corn! So no really a big fan of candy corn, they're just too sweet for me. Same goes for oreos, although I'll eat them if I have milk, a lot of milk. But they look kinda pretty. I love traditional Oreos!! So good to finally have something new. Hopefully they will be available internationally! Not so much .. I'm a fan of the double stuff chocolate but my grandsons would love these! I think they look great. 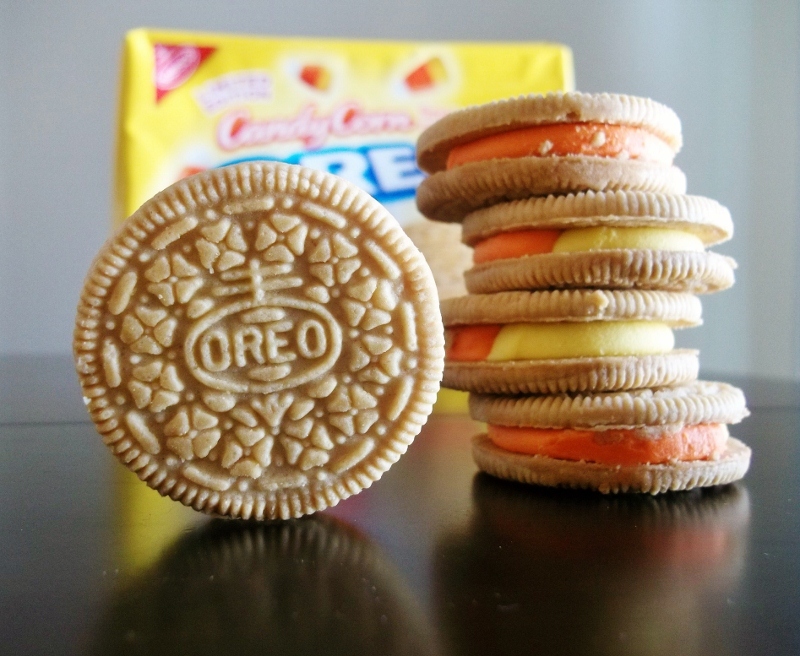 I love candy corn and I can't think of anything better to pair it with than Oreo's. What a fantastic idea! So glad I'm not the only one having trouble finding them! This was a pretty thorough review, and it sounds like you went to a lot of trouble to get them. I have to go to Target tomorrow anyway, so I will have to see if my Target has them. Without trying them, I am about 50/50 whether I will like them a lot, but I am anxious to try them. I can't find them, which I could try them though they look perfect for halloween. These are so cool! I don't know if I'd like the taste, but I keep meaning to try them! These look delicious! fun for halloween! 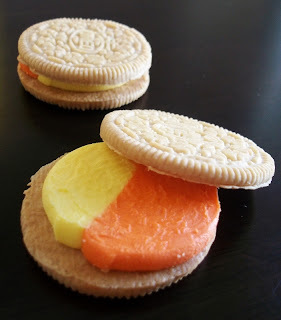 We love candy corn and oreos, so we'll have to try those before it's too late! I didn't even know they were a new product! Im Addicted to candycorn so these look awesome going to pick up some today!!! WRONG time for me to be dieting! I still haven't seen these in the store. I love candy corn and I love Oreos. What a great combination. Anyone liking Candy Corn will be Happy. I have to tell the truth I do not like it. But I would imagine it would not be so granular on a cookie. That sounds delicious. Green Tea Oreos, though.. Ick. They look yummy! I'll look for them on my next shopping trip. I love candy corn! I always stock up during the after Halloween sales. I wish I could find these so I could try them. I saw these Oreos at Wal-Mart and my first reaction was "eww" but then I have heard nothing but great things about them and wish I had bought some. Everyone is sold out now! I love Oreos and I love candy corn, anxious to try these! I'd buy them because they are so festive and we love Oreo's! I can't believe they didn't have them with the seasonal stuff, hmmmmm. I am dying to try them, they look good. I love Golden Oreos - I'm going to have to give these a try! We are definately going to hunt these down! I'm a candy corn addict! I've never heard of them, but they look tasty! I don't actually like candy corn but I would try these if I could find them. My favorite Oreos are the chocolate stuffed ones. Why anybody would buy these is beyond me. candy corn is bad enough, but putting them in a cookie?! bleh! i hope i can still find these in the store!!!! These Oreos look very tasty. I'll definitely keep an eye out for them!